Wage gap, reproductive rights, everything fought for in the Women’s Liberation movement of the 60s and 70s; are still relevant issues today. Easily forgotten by slow progress, people often shrug off these concerns. By utilizing the electronic glitch, I make reference to the “brain dead” or “information overload” moment of disconnect, to reference gender equality as desensitized by an internet driven culture. 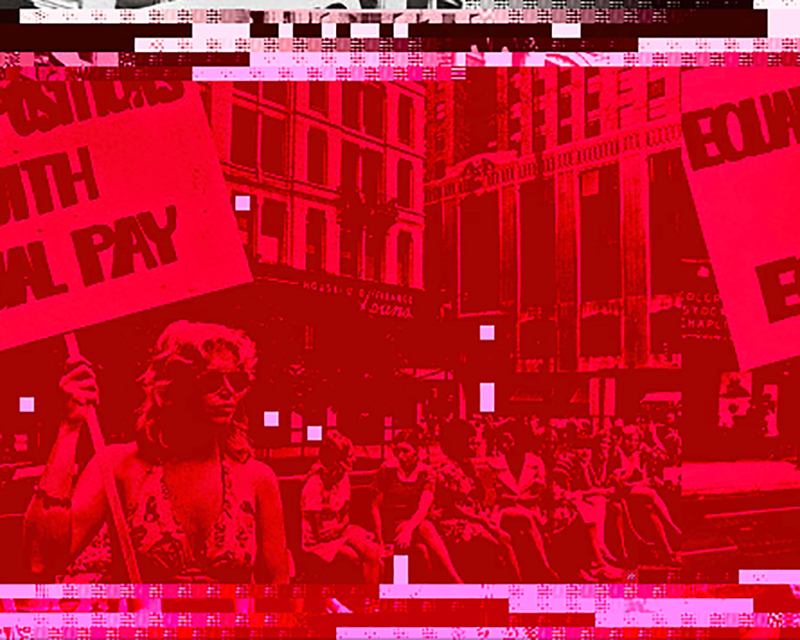 This work reappropriates found images from the Women’s Liberation protests in the 1960s and 70s, and speaks to how those issues are still relevant today. By using existing documentary photographs, I directly credit the women who fought so hard for what they believed. The process begins as an action that opens an image in a Text Editor program. By doing this, the entire code is visible and editable. The structure is defined by the original text inscribed on the picket signs written by the protestors. Through repetition of this language, this chant transcribes the resulting manipulation. The “glitch” in this work references the digital bug that interrupts a television program, for the frustrating few moments before returning to normal. That moment becomes a disruption of vision that breaks time within a continuum of information overload.